It's impossible to miss a poster light box, isn't it? The development of efficient backlighting methods has allowed this type of signage to really "shine" in commercial usage. 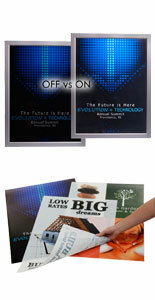 Today's economical poster light boxes combine custom graphics printed on translucent materials with bright, optimally diffused lighting to create visually striking messaging that stands out to customers in almost any environment. Energy efficient LED and T5 fluorescent bulbs provide superior LUX ratings and brightness while minimizing operating costs and labor. 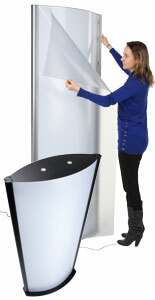 The commercial grade light box, also known as an illuminated snap frame, makes it easy for businesses in any industry to promote merchandising efforts, advertise new products or services, create wayfinding or directional signage and much, much more. The variety of available finishes, shapes, mounting styles and graphics sizes makes it possible to match the needs — and décor — of any location. What differentiates one illuminated snap frame from another? The difference between our Deluxe and Economy poster light box models has to do with how the actual light is diffused inside the fixture as well as the type of lighting used. Laser engraved 8mm thick diffusion panels and LED light signs with 3-chip modules distribute light evenly throughout the lightbox to create backlighting that nearly eliminates the problem of "hot" or "cold" spots then viewing the translucent graphics. Our economy framing models, on the other hand, use slightly thinner 6mm panels and 2-chip LEDs that create bright, even illumination with lower LUX levels that nonetheless are significantly higher than "average" light. LED lighting and T5 fluorescent bulbs have different benefits, while offering comparable illumination. Offering different levels of energy and cost efficiency, illuminated snap frames can provide from 1750 to more than 3000 LUX. For comparison, the average lighting in an office is in the 300-500 LUX range. T5 fluorescent bulbs provide the brightest light, but last only around 1.5 years. LED light signs, on the other hand, offer less brightness but will last more than 10 years in constant use and are significantly less expensive to purchase and operate. Framing for translucent graphics is more than just a matter of the size, construction material and finish color of the lightboxes. Because of the unique properties associated with LED light diffusion, there is a world of difference between a "regular" and a "large" (more than 30" wide) model. 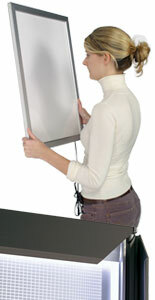 The same strength bulbs in a 24" display will provide almost 50% less brightness in a 30+ inch enclosure. In general, T5 fluorescent bulbs offer less LUX deterioration across larger panels than LED lighting options. Translucent graphics utilize backlight to create a glowing, luminescent image that attracts and holds customer attention in any environment. 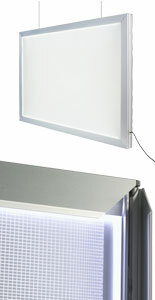 Bright T5 fluorescents or energy-efficient, user-friendly LED lighting combine with light-diffusing panels and sturdy, attractive snap frames to create fixtures designed for wall mounting, overhead hanging or freestanding display. 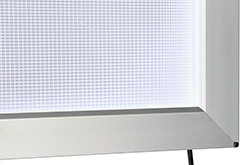 Factors such as initial cost, lifetime cost and ongoing energy requirements will help determine which of our many lightbox fixtures will meet any needs. Our online visual catalog includes specific and detailed information on each unit to help make the buying decision as easy as possible.